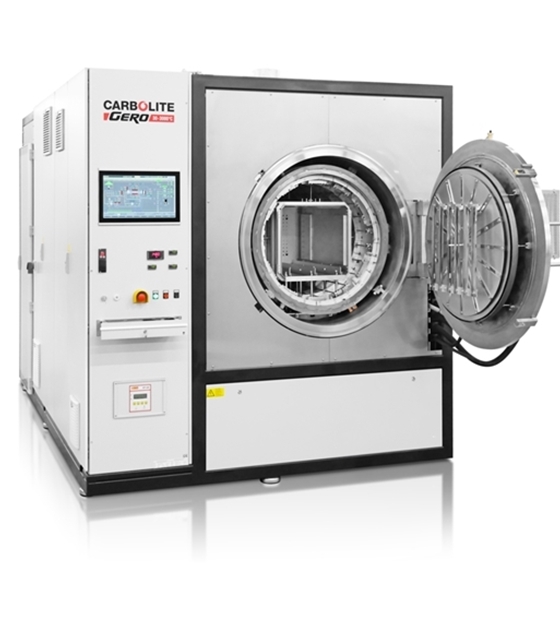 The Carbolite PDS Sintering Furnace is available with a usable volume of 25, 120 and 250 l.
For debinding, a special gas guiding configuration and molybdenum retort are utilized to protect the heating elements from all gaseous by-products. The heating elements and radiation shields are also constructed of molybdenum. The system is surrounded by a double walled, water cooled vessel. To prevent condensation of the byproducts in the gas outlet system, the tubes leading to the afterburner are heated. Debinding is normally performed at a slight overpressure, and upon request, the furnace can be configured for debinding under partial pressure. For partial pressure operation, a special oil pump is integrated into the furnace to pump the gaseous by-products out of the furnace and into the afterburner. After the debinding step, it is possible to increase the temperature up to 1450 °C for the sintering process. During sintering, a vacuum, partial pressure, or slight overpressure can be applied. The system operation is automated, and therefore, can support the use of Hydrogen up to 100 % purity. A touch panel interface is used for parameter programming and process visualization. The PDS offers two operation modes. The first mode is manual operation, which consists of manually adjusting all system features. The second mode is automated and allows the user to program the operational parameters of the furnace. Upon initiating automatic operation, the system performs an evacuation step, a leakage test, and an overpressure test. Once all steps have completed successfully, the operating process begins. In the event any malfunctions are detected, the system immediately returns to a safe state, which is especially important when using reactive gases. Various dosing and controlling devices control all gas operations. The vacuum systems are provided by various pumping stations per the required vacuum levels. The temperature in each of the three heating zones is individually controlled to achieve the best uniformity. The clear advantage of the PDS is the possibility to perform debinding and sintering in a single furnace. Careful design of the vacuum and gas flow guidance system allows the PDS to provide a single solution for the application. The PDS has three heating zones. One heating zone is adapted on the furnace door. The remaining two heating zones are two heating zones at the mantle of the system. With the unique heating design, the pressure and directed gas flow provide a temperature uniformity better than ± 5 K. The heating elements are made from molybdenum. To insulate the heat, several molybdenum radiation shields are implemented. The furnace door is locked by a pneumatic valve. End switches control the doors position, opened or closed. The afterburner must be connected to propane gas and compressed air for combustion of all gaseous by-products generated during the debinding process. Upon request, a fast cooling system can be integrated into the furnace, which operates by evacuating all gas from the furnace and passing it through a heat exchanger. The heat exchanger is cooled by water and cools the gas as the heat exchanger tubes are in contact with the water cooled tubes of the vessel. The cooled gas is then pumped back into the furnace. The cooling system is a circulating, closed loop that provides expedited cooling and minimal gas consumption.